It seems that we use the term ‘friendly and welcoming’ a little too much. But we can’t help it if it is true, particularly in the case of Monday nights at the Merewether Bowling Club. Started back in March 2012, this group grew out of a Monday night ukulele entree class that started in January 2012. Time and evolution have seen this group move across various venues, and numbers have fluctuated. Once it was up to 30 people. These days (mid 2017) it is more like 15-20 people. Mostly Monday night ukers are workers with a few retirees, who don’t want to work too hard on the uke. Relaxing, having a good time, and the drink break – all are important aspects for this group. We meet in the ‘library’ at the Bowlo – an intimate space with nice acoustics. Jane takes Monday nights, starting 5:45, finishing at 7:45pm. If you are a relative beginner, this might be an appropriate group to start with. 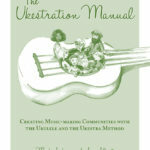 Purchase The Ukestration Manual here. 9 years of ukulele teacher/leader wisdom distilled into 100 or so pages for only $29. Electronic download available now! (Warning! This is not a repertoire book for beginners or ukestrans generally. This book is aimed at teacher/leaders of ukulele groups. But by all means! Download the free preview! ).